A strut with circular cross-section is supported according to four basic cases of Euler buckling and it is subjected to pressure force. Determine the critical load. A symmetrical shallow structure is made of eight equal truss members, which are embedded into hinge supports. The structure is loaded by the concentrated force and alternatively by the imposed nodal deformation over the critical limit point when the snap-through occurs. Imposed nodal deformation is used in RFEM 5 and RSTAB 8 to obtain full equilibrium path of the snap-through. The self-weight is neglected in this example. Determine the relationship between the actual loading force and the deflection considering large deformation analysis. Evaluate the load factor at given deflections. A structure is made of four truss members, which are embedded into hinge supports. The structure is loaded by a concentrated force and alternatively by imposed nodal deformation over the critical limit point, when snap-through occurs. Imposed nodal deformation is used in RFEM 5 and RSTAB 8 to obtain full equilibrium path of the snap-through. The self-weight is neglected in this example. Determine the relationship between the actual loading force and the deflection considering large deformation analysis. Evaluate the load factor at given deflections. A pipe with the tubular cross-section is loaded by means of internal pressure. The internal pressure causes axial deformation of the pipe, what is called Bourdon effect. Determine the axial deformation of the pipe endpoint. A very stiff cable is suspended between two supports. Determine the equilibrium shape of the cable, the so-called catenary, consider the gravitational acceleration and neglect the stiffness of the cable. Verify the position of the cable at given test points. A single-mass system with dashpot is subjected to a constant loading force. Determine the spring force, the damping force and the inertial force at given test time. In this verification example, the Kelvin--Voigt dashpot, namely, a spring and a damper element in serial connection, is decomposed into its purely viscous and purely elastic parts, in order to better evaluate the reaction forces. A column is composed of a concrete part - rectangle 100/200 and of a steel part - profile I 200. It is subjected to pressure force. Determine the critical load and corresponding load factor. 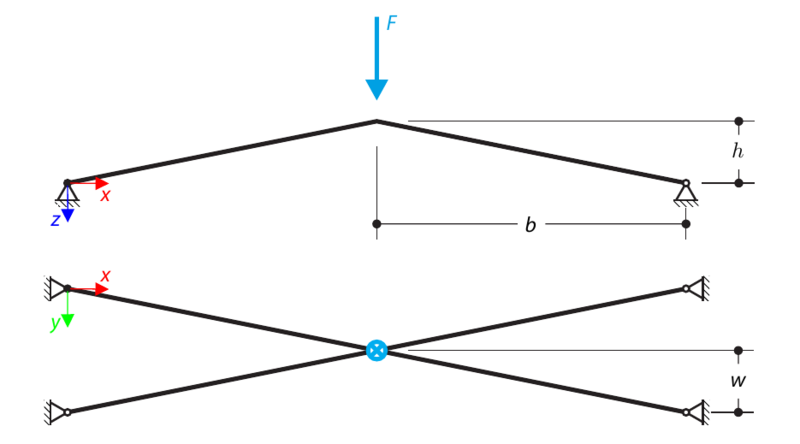 The theoretical solution is based on the buckling of a simple beam. In this case two regions have to be taken into account due to different moment of inertia and material properties. A cable in the initial position is loaded by two concentrated forces. The self‑weight is neglected. Determine the normal forces in the cable. The mathematical pendulum consists of a zero‑weight rope and a mass point at its end. The pendulum is initially deflected. 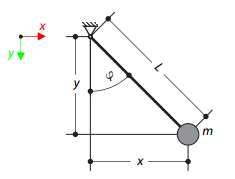 Determine the angle of the rope at given test time. 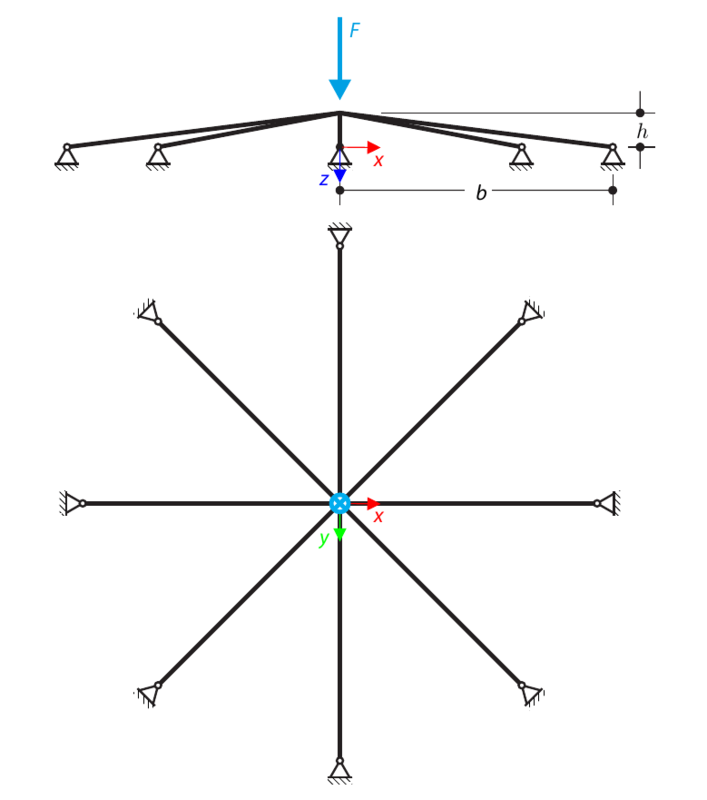 Pinned beam with rectangular cross‑section is subjected to distributed loading and shifted vertically by eccentricity. Considering small deformation theory, neglecting self‑weight, and assuming that the beam is made of isotropic elastic material, determine the maximum deflection. Receba regularmente informação sobre novidades, dicas úteis, eventos planeados, ofertas especiais e vales. Sim, gostaria de subscrever gratuitamente a newsletter da Dlubal Software. A qualquer momento posso cancelar a subscrição desta newsletter. Na página ‘Base de dados de conhecimento’ pode encontrar vários artigos técnicos assim como sugestões e truques que se podem tornar úteis na resolução de problemas de engenharia estrutural com os programas da Dlubal Software.